Here are a couple of small things I made. 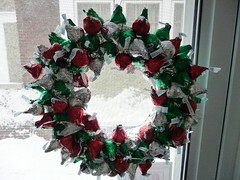 The Hershey Kiss wreath was made with a foam circle from the dollar store which I sliced in half (like a bagel), wrapped around it with aluminum foil, and hot glued Kisses to it beginning with green and adding silver and red randomly. I saw several of these in magazine ads for Hershey Kisses. This only took like 15 minutes to make.